While it's not as extravagant as some other projects we've seen here over the years, like Jarhead Jim's gatlin gun project, or a belt fed upper on our SMG's, I've been really happy and proud of how this project turned out. It was really a long time in the making. 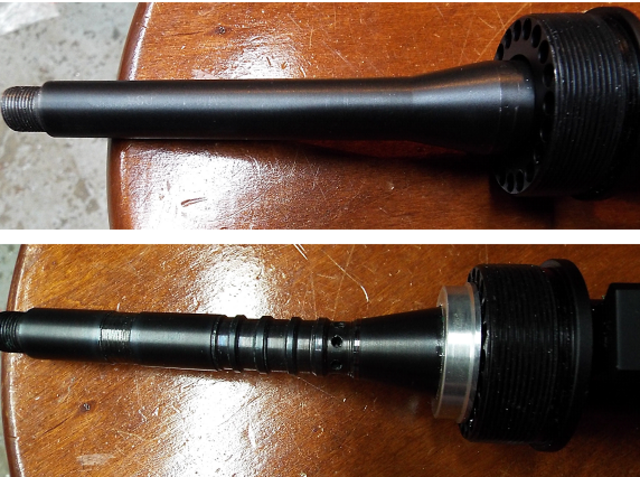 A lot of time spent in the planning stage in order to design and build a good sounding suppressor. Started out as a fleeing idea back during the AWB years. I remembered seeing a dpms upper called the "tuber" that really caught my attention because it was so unique looking at the time. For some reason, it had reminded me of the mp5sd in some ways. While I never really cared for how it looked on the 16 inch carbines, with the extended freefloat tube all the way to the end of the barrel and stuff, I knew after seeing it, that I would like the idea on an integrally suppressed pistol caliber upper that the tuber sparked in my head and it stayed there until I was ready to do it. So, now that I've given props where it's due, a little about the project. 6.5" ported barrel. The barrel started out as a 10.5" PSA 1/2-32 barrel. But since that would never work, I shortened it and rethreaded it properly. I also made some grooves in the barrel. Similar to the old Tommy Guns that act like a heat sink. But it was mostly done to lighten the part and give me a spot to port the barrel. 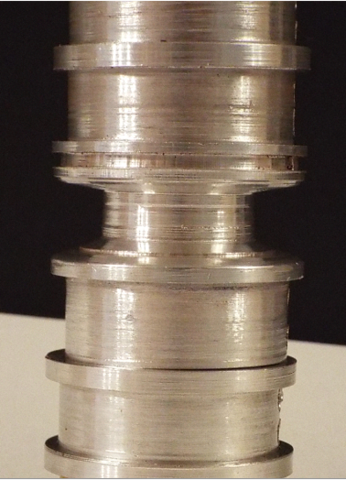 The next couple of pictures is going to show the integral/reflex portion of the can. You can see in the bottom picture where I made a rear cap inside of the tube to block the holes in the barrel nut so the ported gas wouldn't leak out of them. 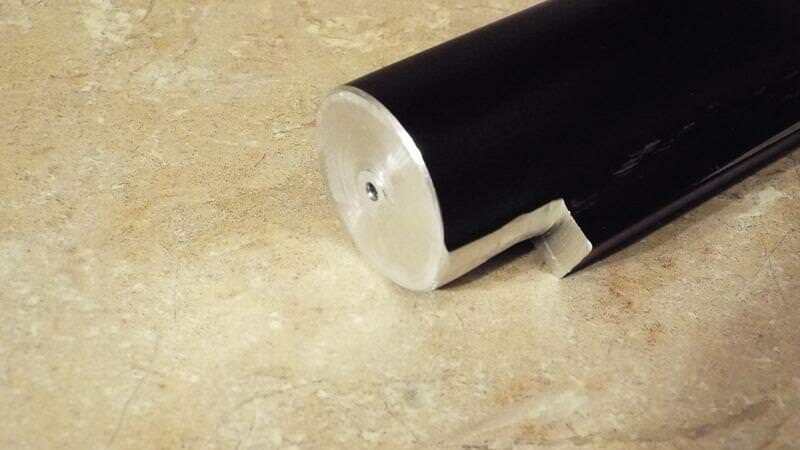 This mostly acts as nothing more than a plug to contain the gasses once the inner tube is tensioned in place by the divider that screws onto the barrel threads. Obviously, the divider mainly just seperates the reflex/integral portion over the barrel and the baffles, other than allowing me to adjust the tension on the thinwall tube over the barrel. Between the barrel threads and the rear barrel nut cap, I made a piece of thinwall tubing that would fit underneath of the handguard to further segregate the gas and to keep the buildup off of the inside of the freefloated handguard so it can be removed and cleaned (the freefloat handguard is the suppressor body and the registered part). The entire self contained suppressor is 12 inches long (including the area over the barrel). So, that leaves a huge amount of area for baffles and a lot of internal space to work with. I'm proud to say that after you finish shooting a mag, if you lay it on the tailgate of the truck and walk back over and pick it up 3 minutes later after loading some more mags, smoke is still coming out of the front of the endcap, so, it's a very effective design. I did drill and tap some holes in the suppressor body. That's something not many people do these days, but I needed to install a front rail for the front sights and anything else I wanted to mount up there. I currently have a small light but you get the idea. You could mount just about anything you wanted to. I borrowed a lot of ideas from old WW2 designs and incorporated them into the build but it has worked out great. It sounds great and isn't unwieldy at all. Another thing, was the method of attaching the front endcap. Instead of threading the front of the tube to screw in the endcap, I used 5 screws through the side of the body to hold it in place and to keep all the spacers and baffles seated properly. This was mostly done that way because my lathe was too short to fit the handguard between the centers to thread the tube and do it that way, but after it's shown to work as well as it has, I can honestly say that it's grown on me. It does remind me a lot of how the Delisle looked. And I think most of us here can appreciate the simplicity, and how well it worked overall. The front endcap was made in a similar way as the Welrod. It is hollowed out a lot in front. I mainly did it to reduce weight but the welrod was made the way it was so if it were pressed up against an SS skull or body, so if the bullet started to yaw immediately after leaving the muzzle, that it wouldn't hurt the silencer components. So, while I never pretend to would use it for that purpose, that's just another throwback to earlier designs. Here's a snapshot of a welrod endcap for those that have never seen one. And a shot of my front endcap before it was finished. Since I hate wasting space, I took the liberty of making the inside surface of the endcap into the final baffle as well. Here's what the inside of the front cap looks like. (the chatter marks were intentional to make it as rough as I could to disrupt as much of the gas as I could). I created them by hogging down too hard on the cutter. The outer ring is recessed so the spacers will seat below flush and will be impossible to move around once everything is together so they'll remain stationary. The front and back of the baffles are also grooved the same way. The baffles I made were sort of Omega'ish style but not really. That's just the most similar design that I can think of to compare them to in terms of how they look. I intentionally made the bottom part of the spacers solid so it would further insulate the bottom part of the silencer from heat as much as possible since that's obviously where the hand is going to be most of the time. But I vented the top part of it to make sort of a "chamber in a chamber". Since the gas will be ported up to the top of the can, that's as far away from your hand as you can get. Though, those are only present in the very end of the suppressor anyway. The area where the M203 handguard is almost entirely over the barrel where it's triple insulated anyway. 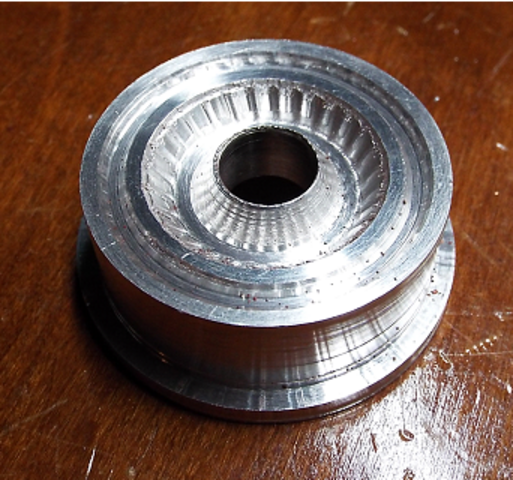 Here's the porting that would be seen if looking down through the top of the silencer. (I straightened up the ports better after the photo. That picture was taken for a friend to give him an idea of what I was trying to explain to him that I was doing before I completely finished them. Not much left to say about it, other than to just show how it turned out. The M203 handguard as many of you know is pretty thick. Which helps further insulate your hand from heat while you're shooting. I'll be honest, I've never felt uncomfortable shooting it. The handguard also gives the upper a reminiscent look of the mp5 SD, though much more defined. And still very comfortable to shoot. One last thing to mention about the pistol lower, while the buffer tube may look like a collapsible stock buffer tube, it's not. It's an old bushmaster AWB part. It is not machined to accept a collapsible style stock or a rifle stock of any kind. It was made that way during the AWB as a ban compliant tube. Nothing real special about it and it laid in my spare parts bin for more than a decade and was certainly a take off part at one time, but since I used it on this pistol lower, I wanted to make sure that it would not be mistaken for something its' not. In order to mount the tailhook brace on it, I had to remove enough material from the rear of it, to slide the tailhook in position and clamp it down. This also ensures that the brace can't intentionally, or unintentionally be adjustable or be moved. I only shaved enough to seat the brace in place. I also shortened the tube some so it didn't fall over the "atf imposed grey area" of having too long of a length of pull. I was very mindful to stay below their arbitrary 13.5" length of pull. 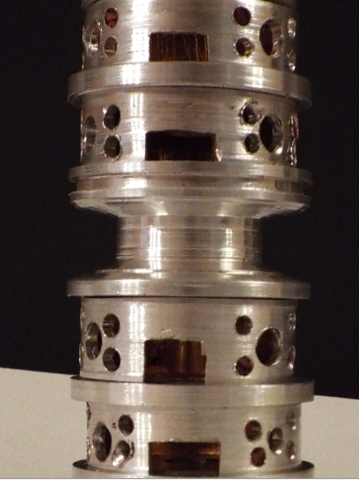 Here's the tube after machining and before refinishing. And as you can see in the photo below, there is no machining or grooves or holes done to the bottom of the tube to accept any sort of collapsible stock. It's solid the entire length. I often shoot it on my SBR registered lower, but lately, it's been staying on the pistol lower since I get tired of swapping buffers and springs and mag blocks and stuff. Anyway, I thought some of you would get a kick out of seeing a bunch of pictures and listening to my rambling. I think it's safe to say that there isn't another like it anywhere. I need to get some video showing how it sounds with the 165gr reloads. It's really sweet. Well done. I like it. Is that a nomex wrap? Thanks guys. I appreciate the compliments. It was a lot of work, but worth it to me in the end. It's nice to see an idea work out as hoped. Is that a nomex wrap? No, it's a modified LMT M203 launcher handguard assembly. Last edited by MPA guy; 10-07-2018 at 11:04 AM. 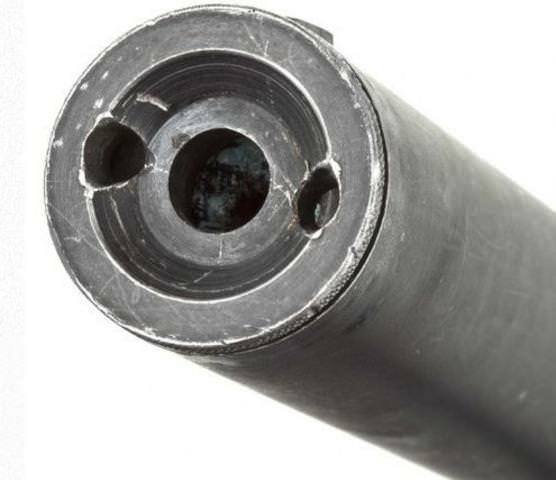 I was refering to the picture showing a material wraped around the barrel , secured with black tape. Oh, OK, I'm sorry that I misunderstood what you were asking about. 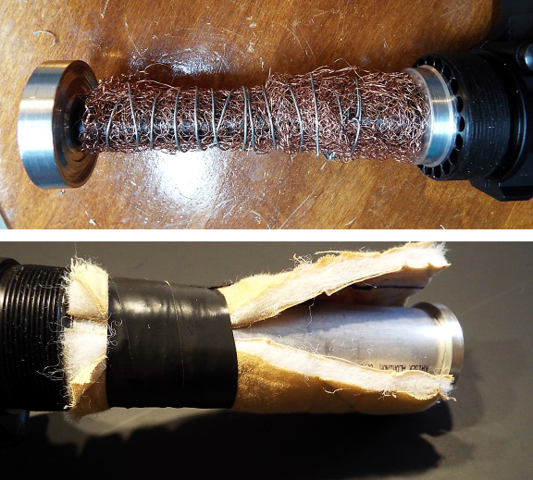 That was insulation to go between the inner tube over the barrel and the outer tube (suppressor body) to further help insulate where your hand will normally be. Plus there is the aluminum suppressor body (handguard) and on top of that, the M203 launcher handguard, so your hand is about as far removed from the source of heat as it can possibly be. It was a piece of a kitchen pot holder that was cut to size, and then I used tape to secure it over the reflex/integral tube to keep it from twisting and moving as the handguard/suppressor body was screwed onto the barrel nut and tightened in place. I don't think it's nomex. It's probably some type of polyester if I were guessing but you're correct that it's the same purpose and principle as nomex. I was concerned that the black tape would melt and degrade faster over time, so I removed the black tape and used cloth surgical tape instead. Here's a picture of just the reflex portion over the barrel that you wouldn't normally ever see underneath of the tube when everything is assembled. Last edited by MPA guy; 10-07-2018 at 12:04 PM. Ok. I understand. If you are looking for nomex, Amazon has nomex tape. I do not have experience with this specific product. But I have seen this type of nomex used in industry. That looks really good timkel. I'll order a roll of it. I have a couple of projects around the house I could use that for anyway. And the 1/8" thickness would be perfect too. Looks great. I'd love to do something like that. Very fun. Are you thinking of trying some of the new 9mm Endomags? strobro, I would like to try the endomag. I was going to get in on the preorder, but I wanted to hold off until the first batch were out to make sure they weren't full of problems first. So far, I don't recall seeing any videos of them in the wild yet so I'm hopeful that they're working good. I've been using my old colt/uzi mag adapter in the gun and it's been nearly flawless. But I do admit that I like the regular full size mag better. I guess it's just what I've gotten used to over the years and the uzi stick mags just feel "wrong" when doing mag changes. If I do switch over to the endomag, the pistol lower will have some roll pin holes through it that I made in the mag block to ensure that it didn't move around while I was using it, but I can live with a couple of roll pin holes. It has served its' purpose. Beautiful work, very nicely done. I’ve never been an AR guy but the new Lage upper has opened my eyes to some opportunities on the platform. Great upper!! Thanks guys. It's been really fun to shoot. That's what it's all about.